I offer a variety of signature facials to target your specific skin type. Express facial, classic facials includes massage, dermaplanning or microdermabrasion facials. Facial treatments are performed with medical grade products rich in vitamins, AHA blends, plant-derived stem cells, peptides, retinols, brightening agents, salicylic and powerful antioxidants to address skin concerns such as dryness, oily problem skin, acne and sensitive skin custom to your skin type for optimum results. 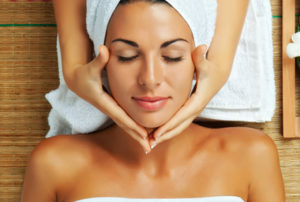 Facials enhance the texture and tone of your skin for a glowing complexion and overall wellbeing. Facials help with hydration, smooths fine lines, wrinkles and uneven texture as it soothes and renews your skin. A deep cleanse facial helps get rid of oil buildup, toxins and dirt from our Arizona environment, thoroughly removing all the bacteria that could cause skin issues. A good exfoliation like dermaplaning or microdermabrasion will remove dead skin cells from the surface of your skin and unclog your pores. This will allow your home skin care to penetrate deep beyond the skin surface to get ultimate results. This will also make your skin look softer, younger and make your makeup blend easier and look better. I will analyze your skin and treat issues like blackheads, whiteheads, milia, pimples, acne, sun spots and sun damage, rosacea, scarring, loss of firmness and elasticity. Getting regular facial treatments monthly or a facial every 6 weeks is recommended to minimize or completely treat your skin condition.